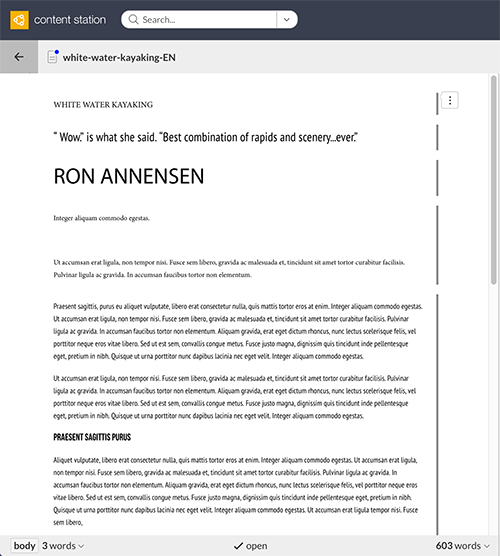 When viewing an article in the Content Station 10 Print editor, (most of) the text of the article is shown in the formatting that has been applied to it. Seeing the different article components styled differently (such as the title, head, sub-head, and body displayed in different font sizes) is of much benefit to the writer. Note: This only affects the way the text is displayed in the Print editor; the actual size of the text in the article is not affected. 1 Requires Content Station 10.6 or higher. In earlier versions the default font size is set to 8pt. A scaling factor is applied to further increase or decrease the display size of all fonts.The default factor is 1.125, meaning that the size of all text is increased by a factor of 1.125. This feature requires Content Station 10.22 or higher. The scaling is applied after the minimum and maximum font size restrictions are set. All options that are described above can be configured in Enterprise Server. Note that these settings are global and affect all users that make use of Content Station 10 on that instance of Enterprise Server. Tip: To remove any restrictions in the way the font size is displayed, set the minimum font size to 0 (zero) and the maximum font size to 1000. Note: These settings only affect the way the font size is displayed when viewing the article in the Print editor; the size of the font in the actual article is not affected. Info: This feature requires Content Station 10.22 or higher. This happens when the value of the maximum font size is set as equal to or lower than the value of the minimum font size. When this happens, the value of the maximum font size overrules the value of the minimum font size. Example: Here, the maximum font size is set lower than the minimum font size. Any text that is smaller than 12pt is now displayed in a size of 24pt; any text that is larger than 12pt is displayed in a size of 12pt. 18 May 2017: Added information about the scaling factor. 20 September 2016: Updated default minimum font size.